Menu: Kale “chips” as an appetizer and then this yummy risotto! 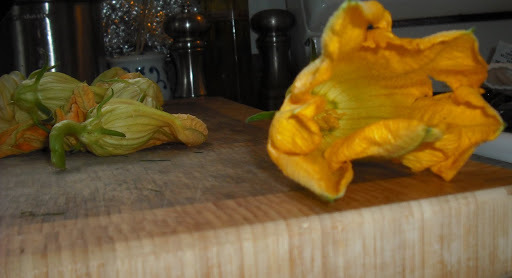 For those of you who have never seen a zucchini plant, it produces these beautiful orange flowers. I first learned that you could eat them from a woman that I play volleyball with. She is originally from Mexico and told me about flower quesadillas, which are the most amazing things you will ever eat. I mentioned that I was growing a zucchini plant and she got really intense and said, YOU MUST EAT THE FLOWER. Then I came across the entry from the NYT blog, Bitten – perfecto! 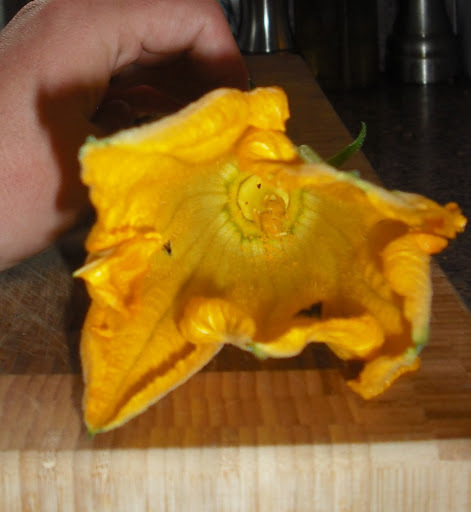 Most classic recipes call for stuffing and frying the flower, which is all good and fine, but just for a flower?? I wanted something simple and basic so that I could taste the flower and savor eating the most beautiful part of my massive plant. 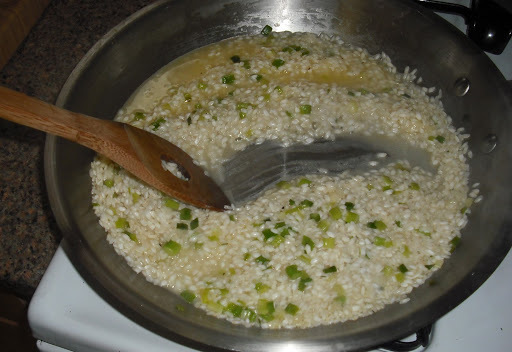 So make your basic, favorite risotto base and add the flower, chopped at the end as your stir in some parm. 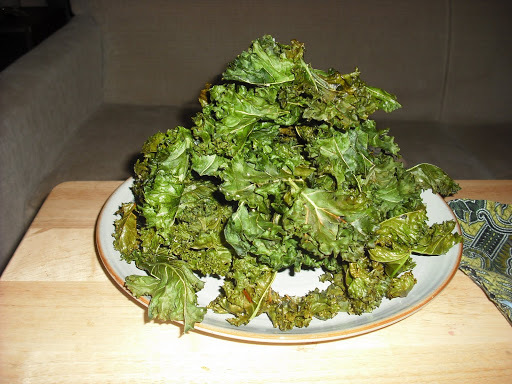 And what a perfect snack as the risotto cooks – kale chips! They are wonderful little things. Crunchy and full of flavor. I recommend making some for the week. I always get cravings for crunchy, salty snacks. If I haven’t packed nuts to munch on, it usually means a potato chip run after lunch But with these on hand, I’m getting my fix, plus some nutrients with it! Heat large skillet to medium-high heat and melt 2 TB butter. Add green onions and saute until lightly browned. Add garlic and saute until fragrant (30 seconds – 1 minute). 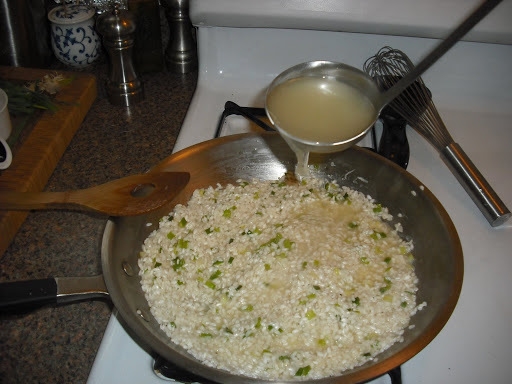 Add Arborio rice and cook and stir until grains become translucent, about 2 minutes. Season with S & P.
Increase heat to high and carefully add wine. Reduce back to medium-high after a minute or so. Let wine cook down, until the liquid almost evaporates. Begin adding chicken stock in 1/2 – 1 cup increments, stirring every couple of minutes, and let each batch cook down until you need to add more. When stock is about halfway gone, add flowers. Continue with liquid. 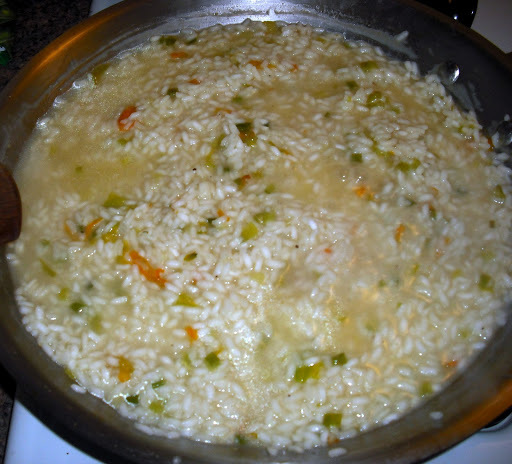 When stock is gone or rice is cooked (no bite to grain) to a creamy consistency, add cheese and remaining TB of butter, stirring to incorporate. Wash and dry leaves. Cut the tough stem out of the middle of each leaf and tear into chip and bite-sized pieces. Toss kale with EVOO and kosher salt. Transfer to baking sheets in one single layer and flatten. Bake for 25 – 35 mintues, depending on flatness of leaf. Keep an eye on them!! If they burn they can taste a little chalky, but if they don’t cook enough they are a little chewy! I'm totally making some Kale chips tomorrow!! !